Size of this PNG preview of this SVG file: 551 × 551 pixels. Other resolutions: 240 × 240 pixels | 480 × 480 pixels | 600 × 600 pixels | 768 × 768 pixels | 1,024 × 1,024 pixels. English: A map of the hemisphere centred on -54, -14, using an orthographic projection, created using gringer's Perl script with Natural Earth Data (1:50000 resolution, simplified to 0.25px). 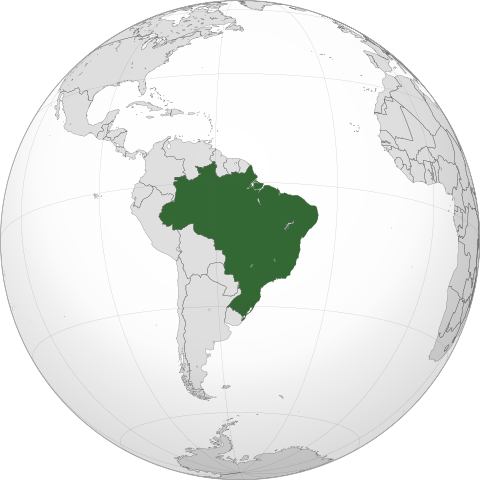 Brazil is highlighted in green. This world map was created with Inkscape. Um mapa do hemisfério central em -54, -14, usando uma projeção ortográfica. Wannan fayil ya ƙumshi ƙarin bayani daga kyamarar dijita ko sikanan da aka yi amfani da su. Idan an sauya fayil kin, to wasu bayannan na ainahi ba za su fito ba sosai a cikin sabon fayil kin.